Can you sell a torch purse to a princess? Do you, Miss Princess, have money to burn? Then let me introduce to you the torch purse – it burns your money for you! How about a bone sandwich to a dog? Mr. Dog, what you need is to eat a sandwich like your owner does. But peanut butter is too sticky for dogs. Designed especially for you, so the move to sandwiches isn’t too abrupt a change from your preferred food, I give you the bone sandwich! If so, Snake Oil – Party Potion, from Out of the Box Games, is the game for you! This game is easy to learn and can provide hours of fun. 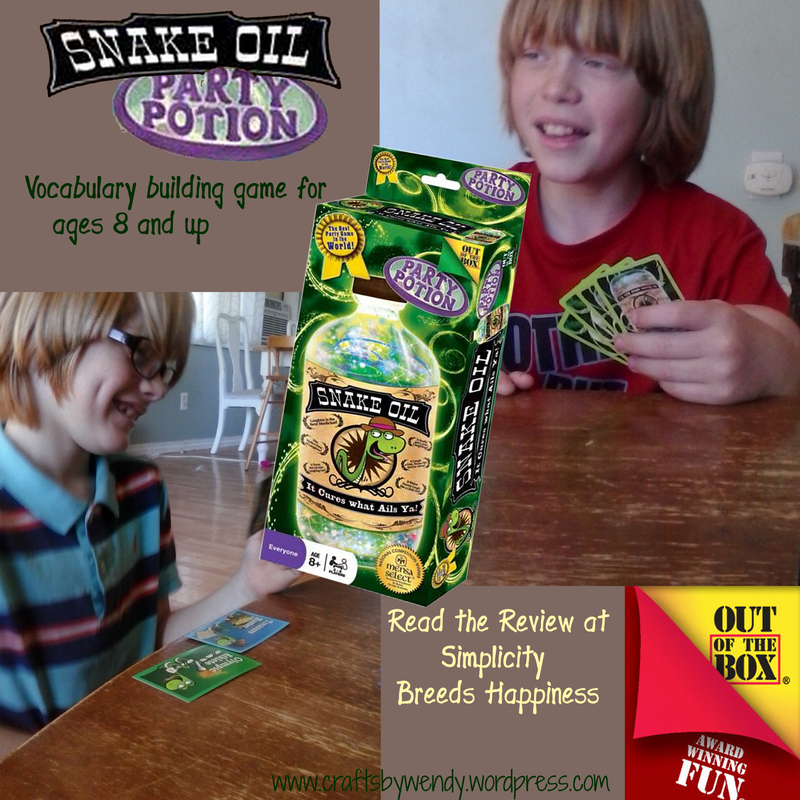 Recommended for ages 8 and up (or as young as 6 if they read well), Snake Oil – Party Potion is a lot of fun for the whole family. There are two decks of cards (word cards and customer cards) and the way it works is this: each player is dealt 6 word cards. One player is designated the “customer.” This person sets his word cards aside and chooses a customer card from the deck. The other players choose two cards from their hand to create a product to sell to the customer on the card. With your product at the ready, make your sales pitch! After everyone has tried to make their sale, the customer chooses his favorite. That person is awarded the customer card as a point. The person to the left of the customer becomes the new customer and you play again. When everyone’s had a turn as customer, the game is over, and the person with the most customer cards wins. Put simply, we just played the game. Because there were only three of us playing most of the time, we modified the end point to be when we ran out of customer cards rather than just going around the circle once, but that’s really the only thing we changed. The first time out, just the kids and I played. A few days later, Will joined us in a game. The boys have even played this game with their friends. I have no doubt that this game will be played over and over again! I’m not going to lie: I was a little skeptical at first. We’ve played similar games in the past to mixed results. But after giving it a fair chance (I did not reveal my initial skepticism to the children), my mind was changed. This is a really fun game that I have no qualms about recommending. It was really fun to play, and we were all laughing a lot. With a retail price of $14.99, this would make a great gift idea for the children and/or families on your Christmas list. Are the people on your list older? Out of the Box games has you covered there too. There’s a “regular” version of Snake Oil, too, recommended for ages 10 to adult.